Today's story, "The Dependent's Tale as told to Marina Lewycka, read by Julie Hesmondhalgh" describes the experience of a child who was subject with her family to multiple detentions, deportations, and finally, permanent residency in Wales. I will be featuring a story from the project at an upcoming talk about Reading the Migration Library. If you are in Kingston, ON next week, please consider joining me and the group, Sala-Manca (Lea Mauas and Diego Rotman of Argentina and Israel) for these events about migration, refugees, shelter, asylum, books, art and more. September 26, 7:00-9:00 pm “Books and Libraries in Migration” - an artist talk about the projects, Reading the Migration Library and Renegade Library, during Sala-Manca's series Temporary Dwelling, Fragile Structures: Sukkot 2018 Canada. September 29, 1:00-4:00 pm, "A Library of Temporary Shelters – A book arts workshop about migration and displacement" with Lois Klassen and Sala-Manca at The Agnes Etherington Art Center. Join us for this event in conjunction with the AiR exhibition at the Community Art Space presenting art and writing by AiR’s Chelsea Comeau, Lois Klassen and Elisa Yon. The afternoon will feature readings by participants of Reading the Migration Library*, a project initiated by Lois Klassen during the June 2017 Artist in Residence at Anvil Centre. Dwellings, an installation by Elisa Yon (May 2017 Artist in Residence) of the chapbooks produced in Reading the Migration Library, will be set up to facilitate an exchange and a one-time give-away of the chapbooks' first edition. Finally, the event will conclude with a reading by featured poet, and April 2017 Artist in Residence, Chelsea Comeau. While at the Anvil Centre, also take a look at AiR Works, an exhibition of art by artists involved in the 2017 inaugural Anvil Centre Artist in Residence program in the Community Art Space on the 3rd floor. November 1 - Reading the Migration Library will be the subject of an artist talk by Lois Klassen in Alex Hass's 3rd year Communications Design class at Emily Carr University. November 5, 3-5pm - Lois Klassen will present Reading the Migration Library at Bruna Press + Archive in Bellingham, WA. There will be an open mic and books will be available to take away. Join the FB group Reading the Migration Library for other opportunities to see and hear migration writers and artists --or to present your own work in public. YACTAC’s pop-up September exhibition launches the latest chapbook in Lois Klassen’s current publication project, Reading the Migration Library. Entitled Flow, this chapbook has been assembled through conversation and collaborative imagining between Klassen and Karen and Peggy Ngan of YACTAC. In this exhibition, Flow is presented as both a wall-based work and an easy to assemble chapbook that will be available for exhibition visitors to make and take away. Flow will be added to a growing collection of easily reproduced chapbooks which make up Klassen’s project. Reading the Migration Library is an archive of multi-form publications (images, poetry, narrative texts, and more) that describe personal experiences with human migration and displacement. This collection is designed for easy distribution and public circulation. Other publications from Reading the Migration Library will be available for visitors to assemble and take away or to locate on-line browsing and reading. Lois Klassen is a Vancouver-based artist and writer whose work combines research and creative methods. Her projects, including Renegade Library, Comforter Art Action and Slofemists (in collaboration with Lori Weidenhammer), combine collective actions with public dialogue and exchange. Her texts have appeared in Word Hoard, Fillip Magazine, Public Journal, Border Crossings, LIVE! Performance Art Biennale blog, and more. Her work has been hosted by Anvil Centre, Santa Fe Art Institute, Mentoring Artists for Women’s Art and Plug In Summer Institute in Winnipeg, Banff New Media Institute, SOMA Summer Institute in Mexico City, Charles H. Scott Gallery (Emily Carr University), University of Salford in Greater Manchester, Glenbow Museum, Western Front, Art Gallery of Southwestern Manitoba and more. Klassen is currently a doctoral student of Cultural Studies at Queen’s University in Kingston, Ontario. Reading the Migration Library has been hosted by Anvil Centre’s Artist in Residence program and the Santa Fe Art Institute Immigration/Emigration Residency. It is supported by Graduate Research-Creation/Community-Based Research and Action Fund, Cultural Studies, Queen’s University, Kingston, Ontario. Some of the outcomes from these workshops may find their way into Reading the Migration Library books! Other ways to get involved in Reading the Migration Library are described in the post above. Do you have a migration story to tell? Would you like to see your story or ideas or poem in print and circulated in public? 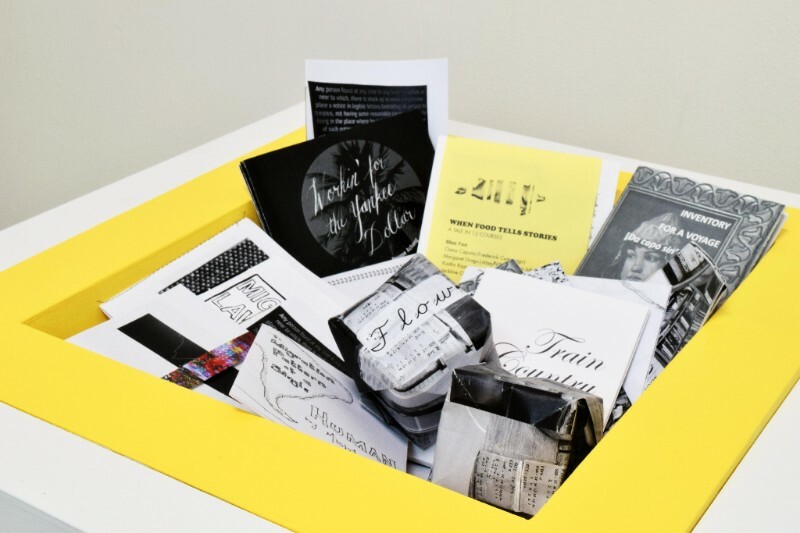 If so, you are invited to join June City of New Westminster Anvil Centre Artist-in-Residence Lois Klassen to compose and design a small booklet (a chapbook or zine) which tells and illustrates your story. Stories can be from your own experience or family histories or your response to current events involving migration. Content can be prose, poems, fiction, non-fiction, image-based or a mix. The content does not need to be in a finished form before before the consultation. The finished booklets (up to 24 pages; 4.25x5.5”; black & white) will be easily reproducible, and each participant will keep 25 completed copies. Participants’ booklets may be included in art exhibitions and events related to the project, Reading the Migration Library (consent information and forms will be provided and described in the interviews). Participants will also have the option of reading their booklets aloud at a public event in New Westminster (date TBA later in 2017). Lois Klassen is available to meet contributors (individually or in small groups) during May and June in the New Westminster Anvil Centre artists' studios. Please contact Lois to set up a convenient time - lois[at]loisklassen[dot]COM. More in May and June! - Watch this site for details on upcoming RTML workshops involving City of New Westminster Anvil Centre artists-in-residence Elisa Yon (May, 2017) and Lois Klassen (June, 2017). Announcing - Lois Klassen's Reading the Migration Library project (RTML) will be a part of the new Anvil Centre Artist-in-Residence program (City of New Westminster, BC) during June, 2017. With the collaboration of artist/designer Elisa Yon, who will be the Anvil Centre Artist-in-Residence during the month of May, 2017, there will be a number of public events in New Westminster during May and June to promote story telling and literacy of migration issues and cultures through book making workshops, exhibitions, and public readings. Watch for information about these upcoming events here! This week has been a kind of Hannah Arendt refresher. In preparation for Wednesday’s VIFF screening of Vita Activa: The Spirit of Hannah Arendt (Ada Ushpiz, 2015), I watched again excerpts of Margarethe von Trotta’s Hannah Arendt (2013) and brushed up on some of the Arendt texts that sit on my shelf and speak down at me from time to time. Vita Activa quoted from the essay “We Refugees” which Arendt wrote to fellow exiled Jews in 1943. A 34 year old, she had been in the US for 3 years when it was published. Her statelessness in the US (it took more than 10 years for her to become naturalized) came after experiencing the refugee condition outside of Germany in France before her internment at Camp Gurs as an “enemy alien.” Although philosophy, thinking, and writing are widely celebrated as the Arendt legacies, she was also directly involved in assisting European refugees other than herself, especially Jewish children who were relocated through the organization Youth Aliya. This text offers a link between her refugee condition and experiences and her theories. I am entering this text into the Migration Library because of this video from the 2014 Chicago Humanities Festival. In it Hannah Arendt’s “We Refugees” is spoken in public by actor Mechelle Moe. Following her reading, the dramaturg Maren Robinson and Moe invite the audience to respond. In the discussion from the floor a Mexican immigrant brings this text into the present with her stories of attending immigration offices, where each appointment and interview was preceded with the question, “What is your alien number?” The woman, a university professor who attends these appointments (medical and bureaucratic) with her daughter, describes the chilling effect of being de-personalized in this way on her child, her Jewish husband, as well as herself. This audience member’s telling of her experience in public, reminds me of another contribution that Arendt made to the subject of public agency and the role of story. From The Human Condition (in the “Action” chapter), Arendt describes the active element of story telling, “Action reveals itself fully to the storyteller, that is, to the backward glance of the historian, who indeed always knows better what it was all about than the participants.” It is a provocative challenge to the truth of the past that is characteristic of Arendt’s theorizing. Arendt’s provocation is for the voices of those who experienced trauma in the past to be ever-present, and for those of us who witness the telling to let the stories take action –let them actively challenge how politics are practiced in the present. on defying the isolation -- readers lost in words together. Thank you to the artists in residents at Santa Fe Art Institute, also Nina Elder and Erin Elder, for participating in this public reading of words found inside of the nearly infinite migration library. Thank you especially to artists Nuttaphol Ma and Mauricio Esquivel for leading us towards a book of the east, Letters from Thailand (Botan), and a book of the south, Conceptualism in Latin America (Camnitzer). Thank you also to Joanne Lefrak and the the Education and Outreach program at SITE Santa Fe.